Beating up gods in style. 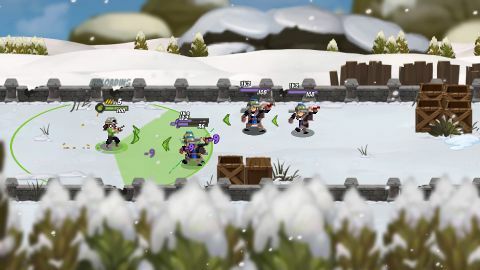 An excellent beat-em-up with tons of wit and great combat, Full Metal Furies belongs on any couch co-op playlist. What is it? Side-scrolling beat-em-up. The Titans are tearing apart the world with their endless wars, crushing everything under petty god-fights and hungry armies, and the Furies have just had it up to here with them. The story of doom that unfolds is equal parts tragic and hilarious, but more importantly, Full Metal Furies supports its war to end all wars with a superb arcade-style sidescrolling beat-em-up: it's tough, it's fast, and it's much more fun with friends. The path to the Titans follows a Super Mario–style overworld map, with short, straight roads leading to levels that unlock more of the road. In each level, up to four players advance along two-dimensional terrain, punching and shooting through waves of bad guys. It can also be played solo by picking two of the four characters and using a button to switch between them, tag-team style. It's challenging and less fun than playing with at least one teammate, but it's doable. The four characters and their fighting styles change the feel of the game in big ways—especially for solo players. As the sniper or engineer, I was constantly pursued as I tried to distance myself from enemies with explosives or turrets so I could safely take shots with my underpowered pistol or take aim with my slow, awkward sniper rifle. The fighter and the tank are much more aggressive, and as those characters I relished being a predator, chasing down enemies to pummel them. The melee classes are more fun overall, but the ranged classes were more challenging and rewarding to master. It's easy to skip over how great the writing is, since quality storytelling has never been a hallmark of the beat-em-up genre—"Welcome to die, X-Men," is one of the internet's oldest memes. But I can't say enough good things about the writing, which glows with a sense of joy and camaraderie between the Furies. Each character has a well-defined comic personality, from the constantly distracted sniper to the science-geek engineer. All four characters join in cutscenes, so solo or two-player teams won't miss any of the banter. The comedy is omnipresent; even minor enemies get introduced with a solid joke or two. Full Metal Furies' most entertaining idea, though, is the deep set of skill trees and equipment upgrades for each character, which encourage creative experimentation and multi-character combos. At one point, I upgraded my engineer's turret to shoot in every direction at once, locking down a section of the screen with low-damage bullets. While enemies were pinned down, I marched my tank right into the middle of the group and used her special power, a shout that flings victims in every direction. Some poor soul had to scrape chunks of bad guy off the ceiling after that move. Enemies vary a lot, from lowly leeches to pyromaniacal minotaurs, each with their own attacks and rhythms. They're introduced little by little to establish how each works, but over the course of a level, all of the new enemy types get folded into crowds of other enemies, and their interactions can be outright hellish. One enemy is equipped with a radio, and he'll call in constant artillery strikes on you until you kill him. Another is a floating turret droid that shoots solid lines of bullets, drawing glowing no-go fences across the screen. I met these two individually on separate levels, but soon they combined to turn the game into a gnarly the-floor-is-lava/bullet-hell combo. Screaming, it turns out, does not help me dodge bullets, but I rarely found the high-speed chaos frustrating. In local co-op games especially, the best fun comes from panicked screaming at friends. There is one issue, though. Some enemies spawn into the battlefield inside color-coded shields which are invincible to everyone except the character with the matching color—blue shields can only be broken by the tank, red shields can only be broken by the fighter, and so on. This forces players to cooperate, and helps less skilled players make meaningful contributions, though it causes more problems than it solves. Especially in solo mode, it's frustrating as hell to have a screen full of invulnerable enemies running around because the one character who can break those shields is unconscious, waiting to be revived. Success was never impossible in this situations, but it also wasn't very fun—an annoying, weird break in the fast-paced rhythm. I really dig the look of the pixel art Furies and their world, which has a sort of World War 2–era-Normandy-meets-diesel-punk-mythology look going on, though the graphics can also be a problem, especially as the shield mechanic gets deeper, with some enemies deploying white shields that are temporarily invulnerable to everyone. Eventually, characters are running around with a blue shield inside a white shield, crowded in with other enemies, a couple dozen bullets, and an array of explosions and particle effects. Full Metal Furies is definitely a meat grinder—I ended up failing and retrying about half of the missions—but persevering with friends is part of why it's great. Even when I struggled with those shields or the visual chaos, or just generally, the charm of the art, the room to experiment, and the quality banter pulled me back in to change or upgrade a character, or just to berate a teammate before giving it another go. And another. And another. It's not the best solo beat-em-up, but with four players in the same room, Full Metal Furies is fantastic.